Digital Designs has been designing projects since 2000, serving as a marketing partner for a variety of clients. We specialize in window posters and point of purchase signage for grocery and other retail stores, but we also offer creative services and digital printing for clients in the music industry, the isurance industry, the logistics industry, the oil industry and others. Please click on the menu buttom to the left to see how we may be of service to you. I am excited to announce I have reduced the cost of my children’s book from $4.99 to only 99 cents if you purchase it through Apple iBooks. For less than $1.00 you can download the eBook to your computer, tablet or smart phone. Your children will love it! Visit the menu page to the left or Click the link below for additional information. 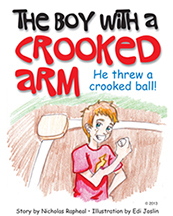 THE BOY WITH A CROOKED ARM MAKES A GREAT GIFT! You may not have heard about Digital Designs in Hendersonville, Tennessee, but you’ve probably heard of the clients we serve. We consider ourselves marketing partners who work in the background to help businesses of all types succeed in their marketing efforts. When you don’t need a full-blown Madison Avenue advertising strategy, then Digital Designs is your place to turn. We specialize in finding ways to make your business look like a million dollars without charging you a million dollars for our services. We view ourselves as an extension of your staff, available when you need us, but not a constant drain on your resources. We have served a variety of client types, everything from NASCAR racing teams to grocery wholesale companies. Please take a few minutes to look around our website and see how we might me of service to you.